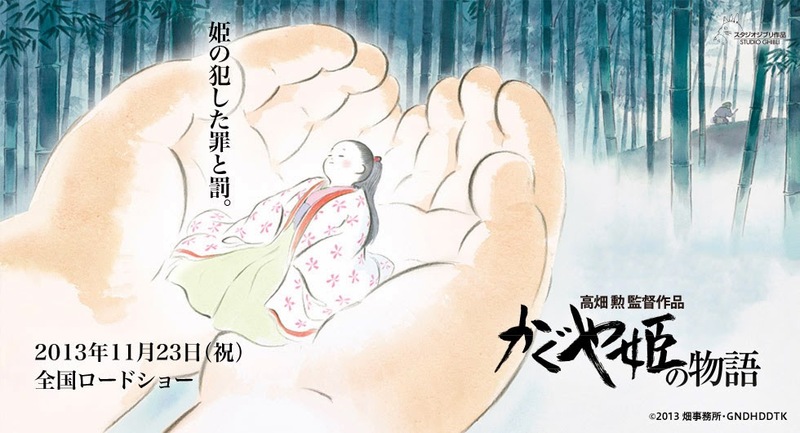 Lets talk some Studio Ghibli specifically their latest film The Tale of the Princess Kaguya. Studio Ghibli if you are not aware is the Japanese animation team that has produced anime films such as Spirited Away, My Friend Tottoro, Howls Moving Castle and Princess Mononoke. They are most known for the works by Hayao Miyazaki, the amazing artist and director. There has been some talk of Studio Ghibli taking a break with the retirement of Miyazaki but he has talked of retirement before and then finds a reason to make another film so we will see what happens. In the meantime there is still plenty of talent at Studio Ghibli to draw upon as can be seen by Kaguya which is directed by Isao Takahata. 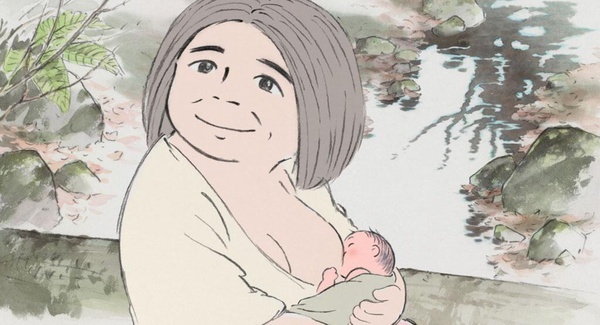 By the strength of this film, I am very excited to see what Takahata has for us in the future! (I guess Takahata directed Grave of the Fireflies which is also dark and beautiful). This is a very different kind of movie than the Miyazaki films and honestly it is going to be a tough sell for some western audiences. It is very slowly paced. The only thing I can think to compare it to is maybe Bambi. There isn’t a strong plot to Bambi but it is beautiful and it tells the tale of a deer growing up to be a prince. Kagayu is kind of like that. 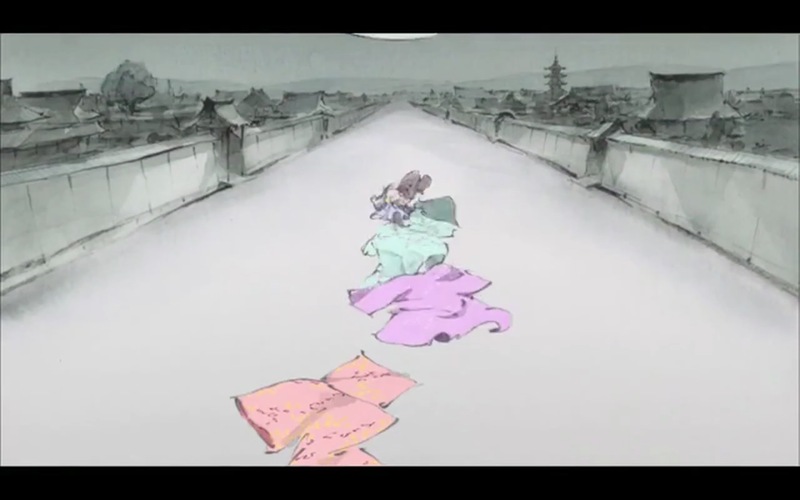 It has a very different look than other Studio Ghibli films and reminds me more of The Secret of the Kells or Ernest and Celestine the way it uses watercolor and hand drawn animation to tell the story. Some may have issues with the film but, nobody can deny that Kaguya looks stunning. 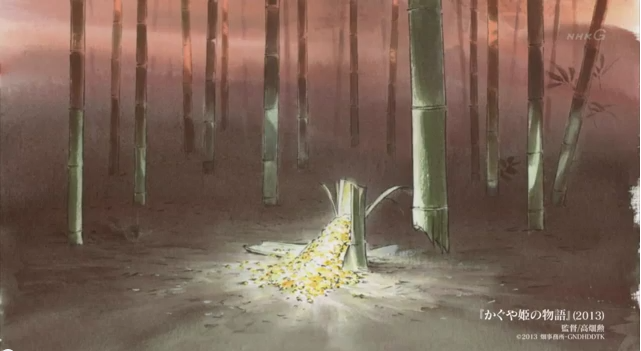 It tells the story of a bamboo farmer who finds a little girl in the bamboo. It looks like a doll but he takes it home to his wife and the baby miraculously grows very quickly as it is taken care of. Kind of like with Bambi when you see him learning to skate or playing with Thumper, in this story you see the baby called Little Bamboo frolicking with her friends. There are multiple scenes with babies bottoms and women breastfeeding which I guess could bother some people but I think breastfeeding is beautiful so that didn’t bother me. You see Bamboo playing with frogs, eating melon, chasing pigs, scenes like that which are sweet but some may want more story. Little Bamboo’s father finds gold in the bamboo and great silks and kimonos and he feels this is a sign from the Gods that she is of noble birth and must be trained as such. 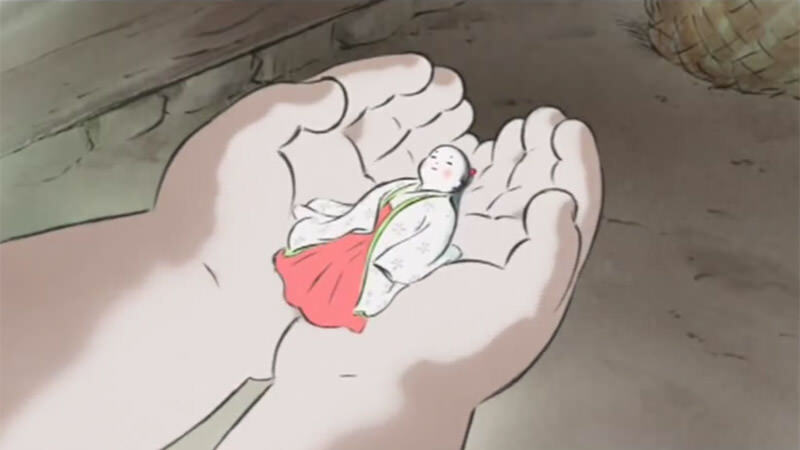 This leads us to the second half of the movie (it is a very long 2 hours and 17 minutes and it is slow paced so like I said some will find it boring) where Little Bamboo is trained as a lady and renamed by the naming man to be Princess Kaguya. This part of the movie is so Japanese and may be a tough sell for western audiences. In Western films such as Mulan or Little Mermaid, our heroines Mulan and Ariel rebel against their fathers and cultural customs and find happiness. 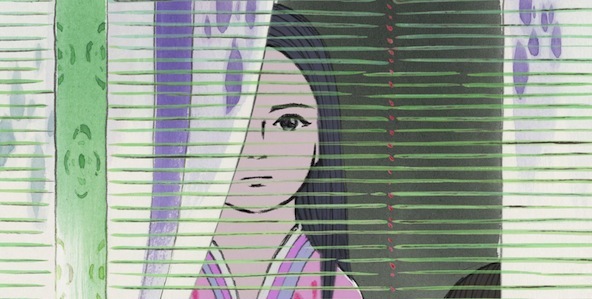 In this film Kaguya repeatedly agrees to do as her father directs whether it is moving to the city, painting her teeth black, listening to suitors, or plucking her eyebrows . There is only one moment where she refuses to submit to the Emperor and be his concubine (all the suitors in the movie have multiple wives and concubines so that’s not the reason she refuses). She has a moment of free spirit that is gorgeously drawn but in the end even the God’s force her to submit. This is such a different character arc than I am used to and it was challenging because it didn’t seem like she was a happy person. She’d have glimpses of happiness but then it would be taken away from her a second later; however, I know that is because I come from a culture that see’s happiness and life very differently, so I try to learn from this culture presented and not be too judgmental of their choices. To Western eyes the ending feels very bitter-sweet. Like I said I think The Tale of Princess Kaguya is a tough sell for the average American audience. It is long. It has minimal plot and the characters make choices that go against our modern sensibilities. However, if you can set all that aside you are in for a treat. It is so beautiful. The music by Joe Hisaishi is one of the best scores I’ve ever heard. 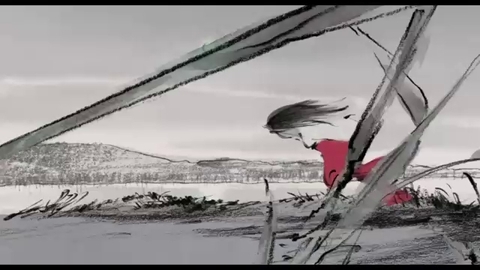 There are whole sequences when Kaguya is running or when a character is at sea and faces a monster that are stunning. There is also something to be said for obedience and submitting your will to a higher power’s plan, even if it makes you temporarily unhappy . As a Christian, I certainly believe that is often the case. There are many things I do not do which at least seem to give others pleasure because I want to be obedient. So it does have a valuable lesson to teach. It’s just not the independence and strong will power we value so much in Western and particularly American culture. I’d be very curious to know what any of you think if you get to see it. The US Dubbing is good with Mary Steenburgen, Chloe Grace Moretz, James Caan, Lucy Liu, Beau Bridges, James Marsden and others. As with all Studio Ghibli films they manage to merge the languages so that it feels like the characters have always been speaking English. 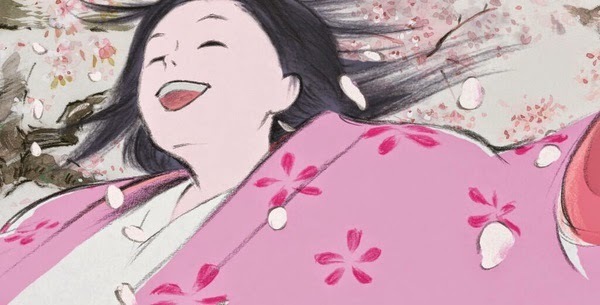 It certainly strengthens my argument of how wonderful 2014 has been for animation because nobody can deny The Tale of Princess Kaguya is one of the most beautifully animated films of this or any other year. It is gorgeous. Some people will definitely have issues with pacing and character’s choices but I was able to move past those barriers and really was blown away by it. See it in the theater if you can not only to get the most beautiful viewing experience, but to support hand drawn animation when you can because the box office is where it really counts. DVD and blu-ray sales help but when studios are deciding whether to produce movies they look at box office sales, so if you love hand drawn animation it’s time to put your money where your mouth is like I did. If it is not playing at a city near you (25 cities so far) than follow them on facebook and contact your local theaters. Let them know you want to see it. It is going to be extremely difficult to determine this year’s Best Animated Feature for the Oscars because I don’t know how you don’t include this film. It is awe-inspiring to look at. I think either Boxtrolls or Book of Life is going to lose its spot which is a shame because they are both so inventive and great to look at. I don’t care if I’m the only one who feels this way I just love this year’s films! If Song of the Sea is as great as people say than the Oscars noms are likely to be Song of the Sea, Tale of Princess Kaguya, How to Train Your Dragon 2, Big Hero 6 and The Lego Movie. I would love to see Hisaishi get a nom for best score because it really is outstanding but it’s been a great year in that department too. A great year for movies! Here are some more clips if you are still trying to decide whether to see it or not. As far as a recommendation for kids it is tough. 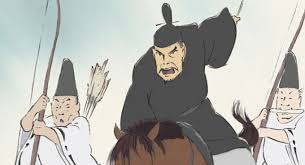 Certain kids will be very rambunctious throughout the film and like I said there are breasts, baby butts and talk of wives and concubines if that is a concern for parents. Other than that there isn’t any content that would be offensive. Nothing is scary or violent. There are some kids who really love artistic films and sometimes it’s the adults that get antsy! I’ve seen that happen many times. My niece who really loves Japanese culture and art I think would love it, so it just depends on the kid. Maybe watch the trailers with them and gauge their interest? But I think it is good for kids to see challenging films on occasion and not the easy to digest but fun films mainstream Hollywood gives them. It’s good for the brain to have to work a little bit harder to appreciate what we view from time-to-time. Yeah, I feel this may take the slot over ‘Jack and the Cuckoo-Clock Heart’ for an Oscar nomination, but I haven’t seen either yet. This has now been certified fresh on Rotten Tomatoes with the exceedingly rare score of a 100%. Usually there is some knucklehead who doesn’t like a great movie. 100% is pretty amazing. This movie is fantastic. It is beautiful, thought-provoking, and deep. I totally agree with you that some may find it a little too slow-paced, but I loved that aspect because it allowed me to just sit and enjoy the art. If there is any movie that proves that animation is a high art form, this is the movie! That’s very true. You could just absorb it in. For a while I was a little frustrated because it was so Japanese. 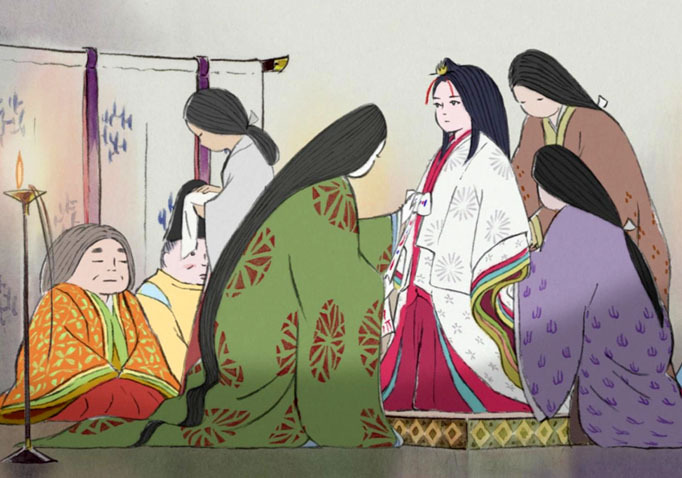 In American films Kaguya wouldn’t have been so obedient (painting her teeth, cutting her hair etc). Even in the ending with the Gods she is obedient when she doesn’t really want to be. That’s so different than what we see in Western movies. We are used to independent women who defy orders and convention. Once I kind of said to myself ‘this is a different culture and I need to appreciate it’ than I got over it. That said, I can picture some people have challenges with that aspect. But it is stunning. Almost every shot could be framed and be a work of art. It reminded me a little bit of Bambi which is also very artistic and about a baby growing into a Prince. It is less plot heavy than just watching a little deer grow up, playing with his friends and learning. The scene with the suitor on the ocean was amazing and her running. Wow. The more I thought about it the more I want to see it again. I actually haven’t seen Grave of the Fireflies so I need to watch that for sure. I’m glad you enjoyed it too. I hope more people see it and are willing to accept the artistry and storytelling of another culture (I have been to Japan so that helped me a little bit. Yeah, I consider one of my main goals in life (I’m only kind of kidding here) is to help people appreciate the magnificence that is Studio Ghibli. I’ve been sold on them ever since ‘Princess Mononoke’ and ‘Spirited Away,’ and I consider every last Ghibli film essential viewing and owning, just like I would Pixar and Disney. I also agree that knowing a little more about Japanese culture helps tremendously when watching these films. In ‘Spirited Away’ for example, even having a rudimentary knowledge of the traditional bath house and those customs in Japan makes that movie make a whole lot more sense. Oh for sure. Spirited Away is my favorite. A masterpiece. When will they ever release it on bluray! I just got Mononoke and Kiki on bluray. I love Ponyo and Tottoro. 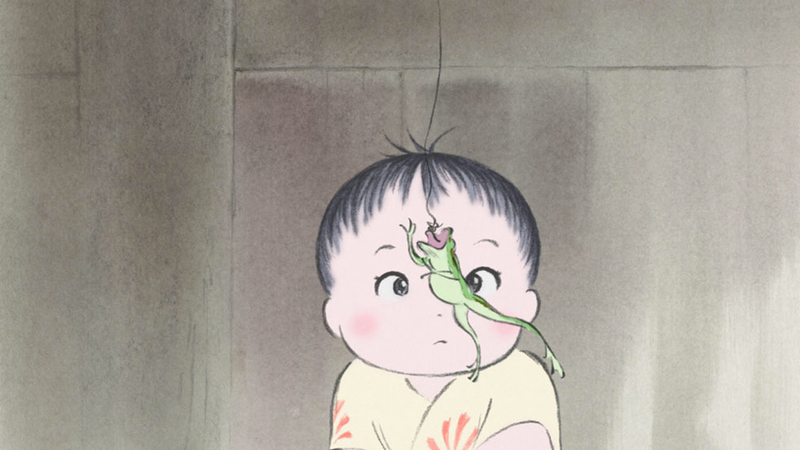 Im pretty up on Miyazaki but haven’t seen Takahata before. I think Miyazaki movies are a little more child friendly and approachable. And the artistic style is very different. This didn’t really feel like anime at all and reminded me more of Secret of the Kelles artistically. I’m totally with you on spreading the Studio Ghibli film message. Ive thought of doing a series on them and Pixar but it seems like with both it will be a whole bunch of gushing A+s (with a few Pixar exceptions) and I dont know if that makes for good reading? I’ve got to think of an angle that would make it interesting. Maybe comparing the 2 studios would be interesting? ‘Grave of the Fireflies’ is an interesting one. I loved that one, and I insisted that my professor (who spent a good part of his life in Japan) watch it. After he did, he told me something very interesting, in that he didn’t like it because it fell into the narrative that the Japanese have believed in, that they were “war victims” when in reality during the time of WWII, they were anything but that. It was a different perspective, and made me think. But I still love the movie and its anti-war message. Comparisons are always fun. Perhaps you could do a tournament? They have roughly the same amount of films each, right? Very interesting. I saw Ken Burns WW2 series a few years ago and was shocked how ignorant I was about the Pacific campaign. For some reason in school we learn all about the Nazis and the battles but nothing about the Japanese but they were brutal. The Botan death march and things like that were intense. 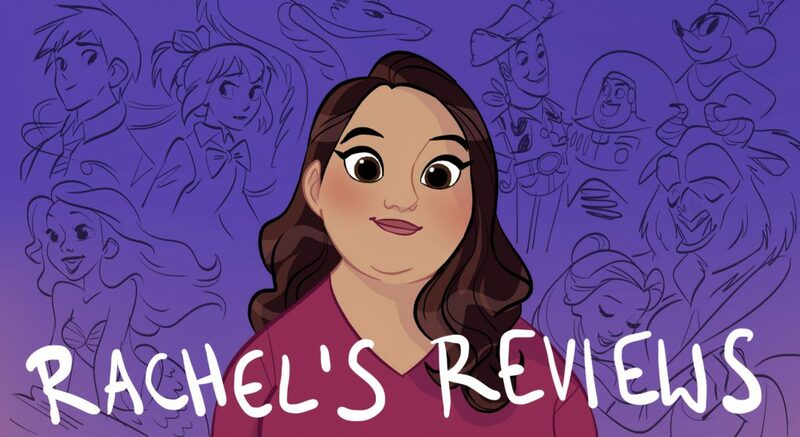 Pingback: Rocks in My Pockets: A Review | Reviewing All 54 Disney Animated Films And More! Pingback: Song of the Sea Review | Reviewing All 54 Disney Animated Films And More!